The NOWAMOM Sale is a children's consignment sale in Marietta, Georgia. We are one of the longest running consignment sales in the area. Hosted by Northwest Atlanta Moms of Multiples (NOWAMOM), our sale is open to the public! The NOWAMOM Sale began as a way for local moms of twins and triplets to help offset the cost of nurturing and clothing many fast-growing children at once. Our sale was started by NOWAMOM (then known as Cobb Parents of Twins) in the 1970's. It continues to be a fun and functional way to serve our members and our community! We currently hold a Fall/Winter sale in August and a Spring/Summer sale in March, both of which take place in the activity center of Sandy Plains Baptist Church. 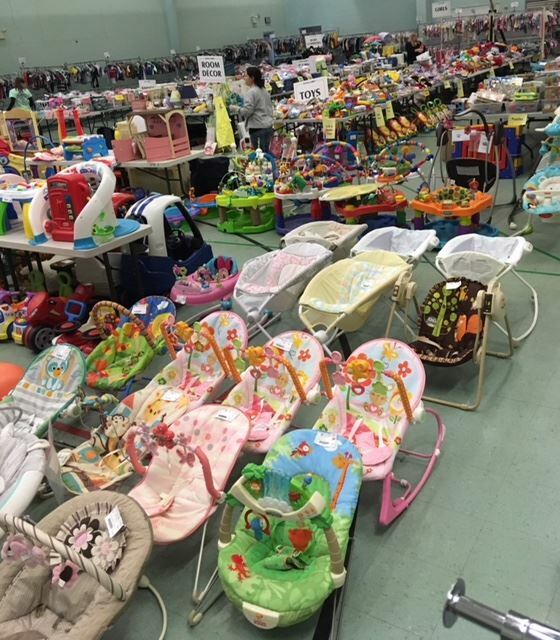 Each sale brings approximately 20,000 baby and children's items, from clothes and shoes to toys, books, strollers, and cribs. We serve the communities of Marietta, East Cobb, West Cobb, Smyrna, Kennesaw, Acworth, Woodstock, Canton, Cartersville, and Dallas. Northwest Atlanta Moms of Multiples is a non-profit support group for moms of twins, triplets, and more! All sale proceeds contribute to our mission of being a resource to moms navigating the unique challenges of raising multiples. Thank you for your support!